The official Hollywood premiere for the Dark Shadows movie is taking place right now at the historic Grauman's Chinese Theater and, to match the film's gothic mood, the traditional red carpet has been replaced with a suitably funereal black. 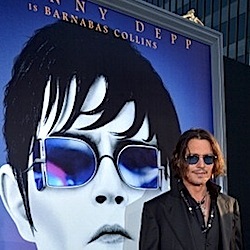 In attendance are Johnny Depp (Barnabas Collins), Eva Green (Angelique Bouchard), Michelle Pfeiffer (Elizabeth Collins Stoddard) and other cast members, along with Lara Parker (Angelique), Kathryn Leigh Scott (Maggie Evans) and David Selby (Quentin Collins) representing the original series. We'll be posting a full report tomorrow, but in the meantime, for live updates and pictures of the stars stepping out, head over to our @DarkShadowsNews Twitter feed by clicking here. AWESOME!!!!! I bet it was grand and delight, the gathering Cast & Crew of DARK SHADOWS: both new & legends.